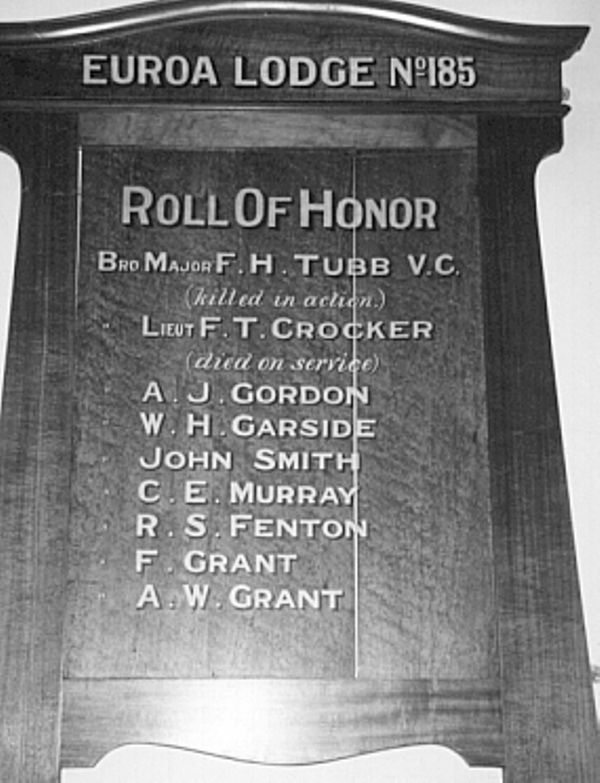 The honour roll commemorates those from the Lodge who served in World War One. The roll contains 9 names. The roll contains the name of Brigadier Major F. H. Tubb who was awarded a Victoria Cross for gallantry at Lone Pine, Gallipoli in 1915. He died of wounds suffered in battle at Polygon Wood, Third Battle of Ypres, France on the 20th September 1917. Euroa. The Honor Roll at the local Masonic Hall was on Tuesday last unveiled by the Rev. F. W. Wray, late Chaplain Lieut Col.
Benalla Standard (Vic), 3 August 1920. Bro Major F. H. Tubb V.C.